From heavy cotton-blend hoodies ready for winter, to light pullovers perfect for a summer evening, One Hour Tees has the right sweatshirt or sweatpants to show off your custom apparel design. We supply over a dozen brands in countless colors, cuts, fabrics, blends, and much more, so you’ll be able to create an incredible, top-notch piece of clothing. Each brand has multiple styles so no need to stick to the basics for a truly unique look. 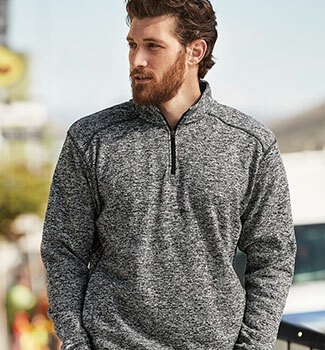 Try fun options like J. America’s Cosmic Fleece, or go extra comfortable with Independent Trading Company’s Sherpa Lined Full-Zip Hooded Sweatshirt. We always promise incredible quality to showcase your custom art. Many of our sweatshirts and sweatpants can be printing on using a wide variety of printing options. This gives you an incredible amount of versatility when it comes to your final piece of custom apparel. Though not every option is optimal for every item, trust our team to walk you through each step to help you pick the right printing method. The One Hour Tees team understands that every project is different. We’ll carefully take your goals, quantity, budget, timeline, and other needs into account so we can provide an incredible piece of custom apparel and overall experience. Do you want your custom artwork on a sweatshirt like, yesterday? Well, we can’t time travel, but using our new Direct to Garment or DTG printing technology, we can create a custom, high-quality customized sweatshirt in an hour. Though not every style or fabric lends itself well to DTG, most sweat options can suit your urgent needs. And don’t confuse DTG with an iron-on. Your design will be top-notch, professional and long-lasting. Aside from a quick turnaround time, there is also no order minimum making this also a great choice for small quantities. If you’re seeking a super sharp and indisputably vibrant design, screen printing might be the choice for you. It’s also a technique that works incredibly well on the far majority of fabrics and styles, aside from a few fleece and knit options. Our screen printers will take your custom design and expertly apply each ink color, creating a gorgeous eye-catching image made for complete durability. As it is a labor-intensive printing method, we will need at least 24-hours to press and the minimum order is 25. Embroidery is an amazing custom design option if you’re seeking a professional, refined style that’ll elevate your look and last a lifetime. We’ll take your unique artwork and use thousands of colorful threads to replicate it on one of the many compatible sweatpant and sweatshirt styles. Not sure if your design will work as an embroidered piece? No problem! Our team will help you develop a design guaranteed to look incredible. The minimum order is 25. The heat transfer printing method is great for creating custom numbers and names, preferably on mesh or polyester materials. Not every piece of apparel will work with this technique. Unsure if heat transfer printing is right for you? Contact us and we’ll be at your side to choose the perfect printing options for your custom printed apparel. The minimum order is 25 garments. One Hour Tees offers so much more than just designing and printing amazing custom sweatshirts and sweatpants. We have a warehouse of apparel options including shirts, polos, accessories, outerwear, and more. If you can wear it, we can print on it.